Working at home can be more challenging than you think, especially when you switch from an office job to a remote job. When you work in an office, you simply get used to the noise so even the silence can distract you. Moreover, working from home requires certain skills aside from your professional field. It has some advantages and disadvantages, just as any other job, so it’s better to be prepared before you start. The home job is a real job! Is a remote job is actually right for you? Remote employment can be challenging, so you should ask yourself if you are ready to face these impediments. Procrastination is the biggest enemy of people who work from home. Once you start, you may catch yourself sleeping longer, doing a laundry or watching Netflix when you should work, or checking social networks too often. The solution? You have to create your ideal schedule and motivate yourself to finish it. Give yourself daily, weekly, or even hourly goals. It can be hard at first, but once you accomplish them you’ll feel proactive and satisfied with your work. If you don’t motivate yourself, you will end up with a bunch of unfinished tasks so you won’t be able to relax even when you’re not working. You have to make sure that your family understands that you have a serious job even though you work from home. Kids can be a real distraction for you, together with pets, household chores, TV, etc. So, plan children’s activities before you start working, make yourself a coffee and prepare snacks in order to avoid breaks, and turn off notification from social media. It’s fine to take a break, but not too often. A separate office space can help you minimize distractions and keep you focused. It’s easy to discuss work when you’re in the same room with your colleague. You can speak about upcoming work with your boss in the kitchen, or go to lunch with your colleague and talk about a project. Nevertheless, discussing the work over the email can be a bit challenging. While you’re writing an email, you have to be crystal clear. You want to skip misunderstandings in communication, so try to write shorter, more succinct sentences that won’t confuse others. Keep your tasks up-to-date and notice others if you going to miss a deadline. If you have some questions, don’t hesitate to ask or even to insist on skype call. Remember, communication is crucial if you want to get your job done well. Sitting in your home alone the whole day is not for everyone. Working from home can make you feel lonely or even socially depressed, especially if working with people inspire you. This is a big change for you, so give yourself time until you get used to the new situation. You will find a way to fulfill the social “whole” in your life. You can chat with colleagues or go to a quiet coffee shop to work. Moreover, if you don’t have fixed hours at work, you can motivate yourself to finish a work as soon as possible, so you can go to a gym or go out with friends. Your computer is your must-have tool, so it’s logical that you will need to become the computer savvy. That means that you will have to understand how to use different software or to update programs and keep your computer running smoothly. A broken down computer or internet connection is a big no-no. Your boss won’t tolerate your tech problems, especially if you have fixed hours. You still think that remote job is right for you? Let’s find a job! If you’re an experienced developer, marketer, project manager, writer, designer, etc, you can make a lot of money working remotely. However, there are many online jobs for beginners, too. For example, teaching language online is very popular and you can schedule classes whenever you want. Also, you can become a writer, translator or a virtual assistant without experience. Once you become a pro, you can earn a lot of money, but you have to be patient. Many clients are trying to take advantage of beginners and to underpaid them. Sometimes you will have to accept that kind of offer just to get a reference, but once you establish yourself as a professional, clients will keep coming to you. First, you have to make a great resume and motivation letter. Moreover, you have to adopt a resume to a job you’re applying. Look at this as this is your work - applying and writing! Try to be original. So, where to send it? Here are some tips where you can find a job that fits you the best. Upwork may be a little crowded, but there are other sites where you can find a perfect job. For example, usual job portals like Indeed or Monster are looking specifically for remote positions. Use the job search engines using terms like "work at home" or "freelance." You will be surprised when you see how many job opportunities you can find, and all you need is to present yourself at your best, spend some time until an opportunity opens and give your best to get the job done. If you follow the work of some company, and you think that this may be your dream job, you can always ask them directly if they have an opening for a remote job. Send them an email or a message on LinkedIn, present yourself and tell them that they can benefit from your skills. Further, you can ask your old colleagues and friends if they heard about some jobs that allow you to work from home online. Maybe they can recommend you. When it comes to social media, not everything is about LinkedIn, although you can find a great job there and connect with other professionals. Facebook groups are another option. Many people are posting ads about new job openings, and you just have to find a group from your niche. You can also look for hashtags like #jobsearch or #openposition on twitter, but you have to check if they offer a remote position. Networking with other professionals is so valuable, whether you’re trying to find a job or you need some advice. Meetup is a great way to connect with professionals from the field and meet them in person. Also, online communities such as Slack groups are a great option. Why should you choose to work remotely? For starter, you will spend less money and time on work - no more traffic or annoying rush hour subway rides, you will eat at home and spend less money. 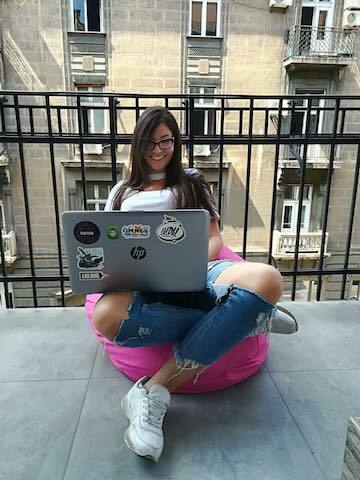 You can work anywhere, as long as you have a good internet connection. Traveling and working - this may sound too good to be true, but it’s possible. You can become a digital nomad and see the world while you have a great job. Further, if you have a pet, they won’t be alone, and they will be your only distraction. No more drama, no stress, no more people coming to your desk asking questions. More importantly, if you have kids, you will have more time to spend with them. Now you know the pros and cons of careers where you can work from home, but it’s always better to try before you give up. However, you have to realise, just like companies did, it’s not the location that matters but the talent. That’s why you can find so many jobs online, but you have to work on your skills in order to find a company that will pay you well and appreciates your talents.